The Quadrifoglio (four-leaf clover) story began as a simple ‘good luck’ charm. Yet it ended up as a symbol to represent track success and race victories for Alfa Romeo and its drivers. Today, Sivocci’s green clover remains a symbol of race-worthy capabilities and, of course, a symbol of good luck. 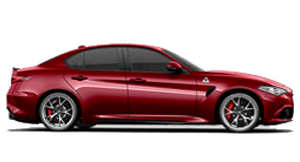 Since 1923, Alfa Romeo has bestowed the Quadrifoglio symbol on only its most powerful race and road cars. Placed front and centre on its highly innovative 2.9L Bi-Turbo V6 aluminum engine, it marks the tradition that now lives on in The All-New Alfa Romeo Stelvio Quadrifoglio. The Alfa Romeo Stelvio is the very first Quadrifoglio that is also an SUV. Created to be the class leading in power, dynamic performance and handling capabilities. The Quadrifoglio was created to embody “La Meccanica delle Emozioni”, the DNA of the brand. A timeless icon was re-imagined with the Alfa Romeo Giulia Quadrifoglio, which was the first chapter in our 108 year history. The Alfa Romeo Stelvio Quadrifoglio is destined to continue this tradition. From the iconic front Trilobe to the sculpted lateral bodywork, the high-performance version of Alfa Romeo’s first SUV truly embodies the iconic, Italian approach to car design. Perfectly proportioned, styled to start your heart racing and created to deliver a surpassed driving experience. The Alfa Romeo Stelvio Quadrifoglio features a unique driving position: high yet sporty. In a cockpit that is minimalist in its design and stylish in its details, the driver is always at the centre of the driving experience. Likewise, in the interiors, where excellence in performance meets maximum comfort, you will ignite your passion from the moment you sit behind the racing styled steering wheel. Details like the red ignition button and the crafted aluminium shift paddles, mounted on the steering wheel, are all engineered to thrill. Taking the wheel of the Alfa Romeo Quadrifoglio delivers more than just a driving experience. The Quadrifoglio will ignite your passion for driving; from the first sound, the first touch. It will be love at first sight. Unique technical solutions. 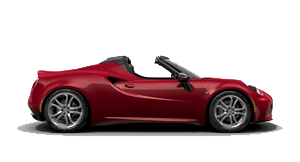 The Alfa™ Chassis Domain Control (CDC) features a "brain" dedicated to vehicle dynamics, a class-exclusive control unit actively coordinating all chassis related dynamic system. 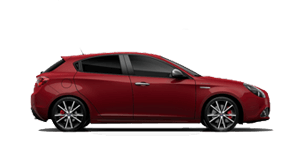 The Alfa™ Chassis Domain Control (CDC) integrates the actions of the Electronic Stability Control (ESC), Alfa™ DNA Pro with RACE mode, Alfa Active Torque Vectoring, Alfa Active suspension, and the Integrated Brake System (IBS). 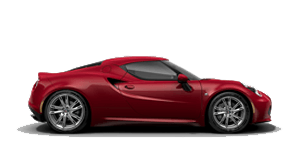 The Alfa™ Chassis Domain Control (CDC) assigns specific tasks to each one of these devices, so there is always optimal performance and driving pleasure. Pure genius. 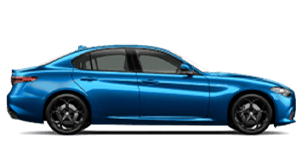 Moreover, the Alfa Romeo Q4™ All-Wheel Drive System guarantees maximum traction in all road conditions, while Torque Vectoring improves traction in the acceleration phase reducing understeer or oversteer. The Alfa link suspension system, the lightweight platform, the perfect 50:50 balance between the two axles, all guarantee extraordinary dynamism. 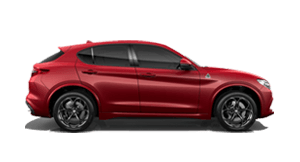 The Alfa Romeo Stelvio Quadrifoglio features Forward Collision Warning (with Autonomous Emergency Braking and pedestrian detection function), Lane Departure Warning, Adaptive Cruise Control, Start&Stop and Blind Spot Monitoring with Rear Cross Path Detection. 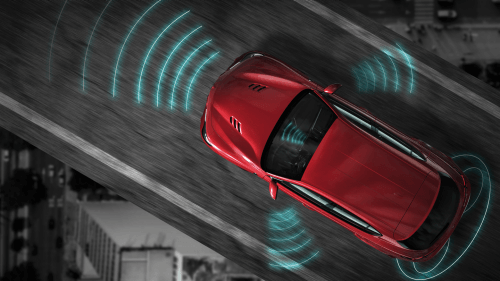 These features monitor the presence of obstacles in front of, beside and behind the vehicle to deliver a high level of active safety in any driving situation. The Integrated Brake System is an electro-mechanical device combining the functions of both the stability control system and the braking system. Besides ensuring important weight optimisation, IBS offers high-precision braking inputs from the pedal, thereby providing immediate feedback. Furthermore, when the ABS cuts in, brake pedal vibration is reduced, working in tandem with stability control to assist in providing the shortest possible braking distance for the prevailing road condition. The Alfa Romeo Stelvio Quadrifoglio comes with an innovative infotainment system, combining an 8.8’’ high definition display with a 3D Navigation, controlled by an intuitive Rotary Pad and an advanced voice recognition system. 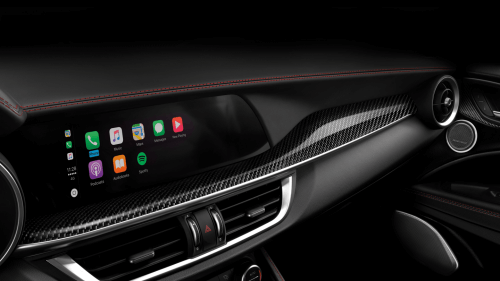 Thanks to the New Alfa™ Connect system, compatible with Apple CarPlay for iPhone and with Android Auto™ for Android devices, it is now even simpler and safer to have direct access to music, contacts, maps and compatible apps on your smartphone. The New Alfa Romeo Stelvio Quadrifoglio has a standard 14 speaker - including subwoofer - Harman Kardon® Sound Theatre system bringing your favourite music to life in high fidelity. With its aluminium engine, the Alfa Romeo Stelvio Quadrifoglio’s performance goes beyond pure power. What makes the driving experience on the Alfa Romeo Stelvio Quadrifoglio so truly extraordinary is its perfectly balanced 50:50 power-to-weight ratio: the best in its class. In mere seconds, the 375kW/600Nm 2.9L; 6 cylinder Bi-Turbo engine is capable of triggering power, energy and precision, whilst at the same time maintaining a level of agility and handling unimaginable for any other SUV. The Quadrifoglio is Pure Alfa Romeo. The Alfa Romeo Stelvio Quadrifoglio is class leading in terms of performance. It offers a 375kW/600Nm 2.9-litre 6 cylinder Bi-Turbo, aluminium monobloc engine, coupled with the New Q4 All-Wheel Drive traction system. A power density of 129kW per litre ensures outstanding acceleration. Furthermore, the Alfa Romeo Stelvio Quadrifoglio delivers a truly impressive fuel efficiency rating, thanks to its exclusive cylinder de-activation system (CEM) and weight reduction solutions, such as the carbon fibre prop shaft. The Alfa Romeo Stelvio Quadrifoglio’s sportiness finds its best expression in the ZF 8-speed automatic transmission that, in RACE mode, enables gear changes in a mere 150 milliseconds. The transmission can be engaged, either with the gear lever, or with the beautifully crafted aluminium shift paddles mounted laterally on the steering wheel. The speed of gear change varies with the driving mode selected: meteoric in RACE mode and greater comfort and efficiency in ADVANCED EFFICIENCY mode. 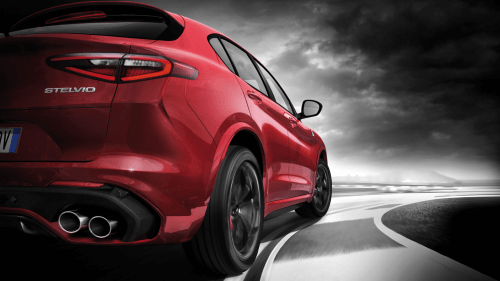 The Alfa Romeo Stelvio Quadrifoglio is equipped with the Alfa™Link Active Suspension: an active system that provides direct control on suspension set-up. The three different modes available, Soft, Medium or Hard allow you to manage the degree of suspension hardness via a simple touch on the Alfa D.N.A Pro. 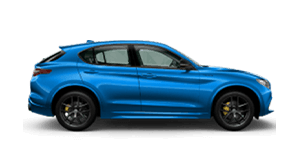 The Alfa Romeo Stelvio Quadrifoglio is equipped with Alfa™ Active Torque Vectoring, guarantees optimal distribution to each of the rear wheels through two electronically controlled clutches, it provides better traction and control even at high speeds and on all types of road surfaces. The Alfa™ DNA Pro, thanks to interaction with the Chassis Domain Control, instantaneously adapts the cars behaviour to the selected driving mode: RACE activates the overboost function and enhances the exhaust sound for driving on both road and track. 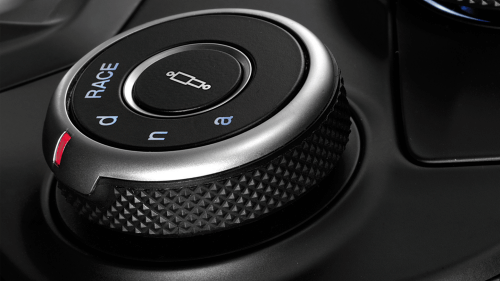 DYNAMIC delivers shaepr brake and steering-wheel response for advanced on-road driving. NATURAL is a comfort suspension setting for perfect balance in your day to day drive. ADVANCED EFFICIENCY enables the engine to maximise energy savings and dynamic efficiency. Most suitable driving mode for long distance motorway journeys. The Perfect Balance Between Performance and Efficiency. The Alfa Romeo Stelvio Quadrifoglio combines extraordinary performance with superior efficiency, thanks to the Alfa™Cylinders' Efficient Management (CEM) system, which allows the 2.9L V6 Bi-Turbo engine to de-activate three cylinders when the driver doesn’t require full engine power. Furthermore, a Start&Stop system of the very latest generation provides additional fuel savings in city traffic. More than just the best power-to-weight ratio in its class- the Alfa Romeo Giulia Quadrifoglio is a study in how to use that power. Its' ideal 50:50 weight distribution creates optimal balance and showcases the advantage of a rear-wheel-drive system in a front-engined vehicle. 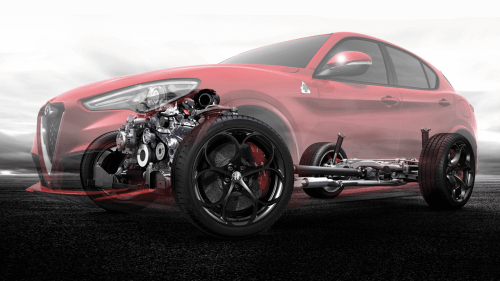 By pairing rear-wheel drive with the Alfa Romeo Stelvio Quadrifoglio's front-mounted, all-aluminium 6-cylinder engine, the Alfa Romeo engineering team have been able to carefully distribute weight throughout the chassis. A body in high-strength steel, wings and doors in aluminium, a carbon fibre bonnet and roof, and aerodynamic body and driveshaft all work in conjunction with an all aluminium suspension to create a perfect balance. Consumption reduced to the minimum. On the Alfa Romeo Stelvio Quadrifoglio, all its electronic systems operate smoothly, thereby helping minimise fuel consumption. Moreover, its patented cylinder de-activation system (CEM) and coasting function reduce CO₂ emissions and impact on fuel efficiency even further. The best way to experience the Stelvio Quadrifoglio is with a test drive. 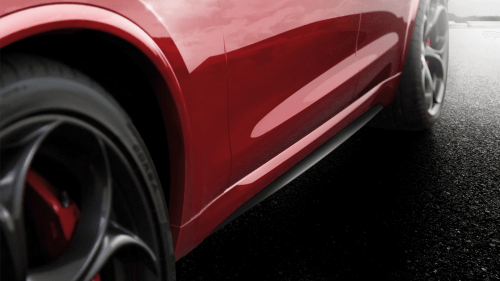 Get the very latest brochure on the Stelvio Quadrifoglio.